10 Fabulously Expensive Homes in North Dakota! North Dakota is a wealthy state due to its large farms and oil field operations. So booming towns in North Dakota are seeing huge, luxurious, multi-million-dollar homes popping up. With dozens of rooms, private theaters, huge barns, elevators, exclusive shoreline, gazebos, and more luxuries, these homes are out of this world! Check out these 10 fabulously expensive homes across North Dakota! This beautiful lakeside property is a paradise with majestic views and plenty of privacy. Only steps from the front door is spectacular Lake Metigoshe. The home is nestled on about one acre, with plenty of room for pets, a family, or a garden. It was built in 1997 and has a light, happy style. Features include 8,000 square-feet of living space including the guest house, 450 of shoreline, about 2,500 square-feet in the workshop area, a three-car garage, and elevator going to all three floors. Zillow reports that is being sold for $2.69 million which would be an astonishing $10,000 per month estimated mortgage! For horse lovers, this is your dream home! Located only 15 minutes from the heart of Fargo, this country estate is nestled on 55 sprawling acres. The log cabin home has four bedrooms, five bathrooms, four huge garages, a gourmet kitchen, large and open rooms with big and scenic windows, and five decks with views of the beautiful surrounding prairie. The property features a cutting edge equestrian facility, a caretakers house, gazebo, two serene ponds, and plenty of wildlife. According to Zillow, this jaw-dropping home is being sold for $2.95 million. Wow! 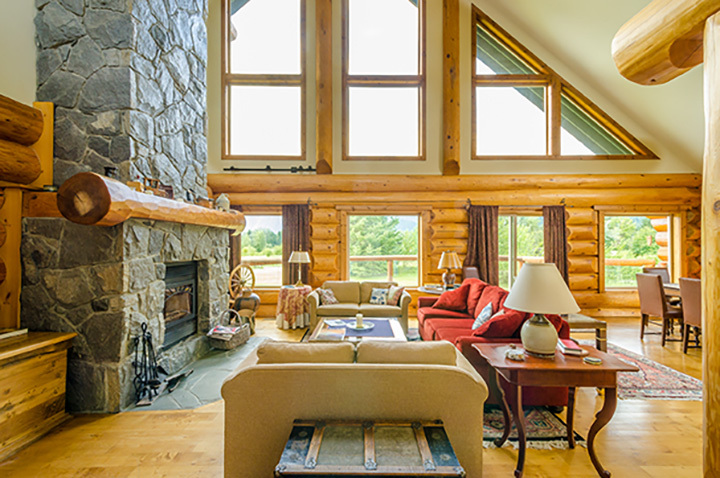 Nestled on the Missouri River right outside of Williston, this comfortable 6,755-square-foot Scandinavian log home was built with logs straight from the Crazy Mountains outside of Billings, Montana. The large home has five bedrooms, nine bathrooms, a fireplace, vaulted ceiling, home theater, office, and more. This outdoorsman’s dream home is on a 720-acre lot with rolling hills, rivers, and wildlife. On the Zillow listing, the home is for sale for an astounding $5.75 million. To put that number in perspective, even with a million dollar down payment, the estimated mortgage is still over $23,000 per month. Watford City’s population has exploded due to the North Dakota oil boom, so big houses are the new normal! The home has over 6,400 square-feet of living space as well as about 8,000 square-feet of shop space. It has five bedrooms, five bathrooms, home theater, hot tub, and more. The house is situated on a 12-acre lot, so there is lots of space and privacy. Zillow reports that this house is for sale for almost $2 million. This is the largest house in the entire state of North Dakota, and it is an entertainer’s dream home! The large home is located in Fargo on the Rose Creek Golf Course. The house is fitted with many luxuries including a relaxing indoor pool room with a full wet bar with grill along with sauna and steam, full surround sound theater room, formal dining room that can comfortably seat 14, and gigantic office with panoramic views of the golf course and Fargo. The home has room for the whole family with six bedrooms and 10 bathrooms on a total of 17,500 square-feet. This home is the pinnacle of luxury in the state and has a price tag to match. Zillow reports that this home is for sale for $1.875 million. Just 20 minutes from Bismarck, this 477-acre farm is perfect for outdoors lovers. It as a small pond and wildlife, making it a great spot for pheasant, duck, or deer hunting. The home has seven bedrooms, eight bathrooms, a four-car garage, entertainment room, office, dog kennel, and chicken coop. This property is selling for about $1.85 million according to Zillow. This unique waterfront home has five bedrooms, four bathrooms, an eight-foot-tall solid Birch front door, elevator, in-home movie theater, outdoor kitchen for entertaining guests, large wet bar, wine room, in-home office, stone encased fireplace, and guest rooms with private bathrooms. Zillow states that this modern home is selling for $1.6 million. Overlooking the bay at Misty Waters, this stunning home has four bedrooms, four bathrooms, chef’s kitchen, wine cellar, storm shelter, sun room, potting room, theater, four patios, and more! This Bismarck luxury home is worth about $1.45 million according to the experts at Zillow. This West Fargo 6,000-square-foot dream home has six bedrooms, four bathrooms, custom bar, theater, game room, attached garage, and plenty more features. Zillow says that this home is selling for $1.345 million. This brick home is located on the Oxbow Golf Course and is the pinnacle of luxury housing. Many of the rooms overlook the golf course and the home has seven bedrooms as well as six bathrooms. Features include a sunroom, patio, cutting edge chef’s kitchen, and master bedroom with deck overlooking golf course. Zillow reports that this home is on sale for almost $2 million. This home is a steal for any golf lovers!